Hey y'all! I hope you're having a great week! I'm at home with my oldest daughter this morning because she got sick in the middle of the night. One of the worst things to be woken up by is a sick child. It's just awful. She seems to be feeling much better right now but I kept her home to rest and hydrate. I also have washed, scrubbed, and disinfected all the things! 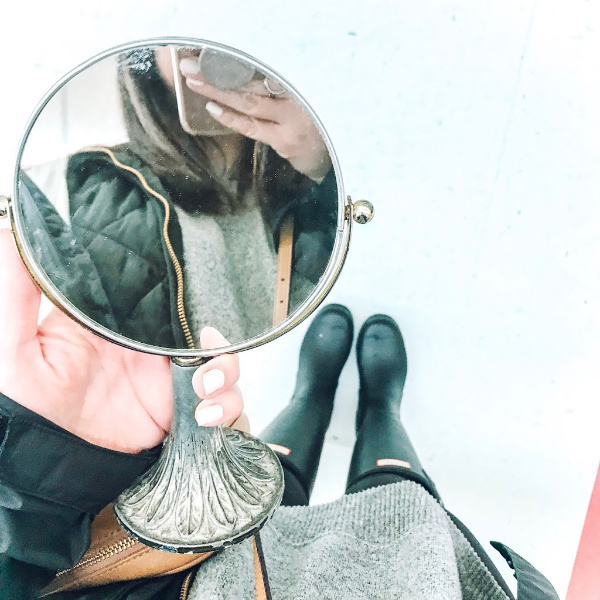 Today, I'm sharing my weekly Instagram roundup, including my outfits from last week. There were definitely a shortage of outfit pictures because it's been raining non-stop. When it's cold and rainy, all I want to wear it leggings and a sweatshirt. All about the cozy on gloomy days! 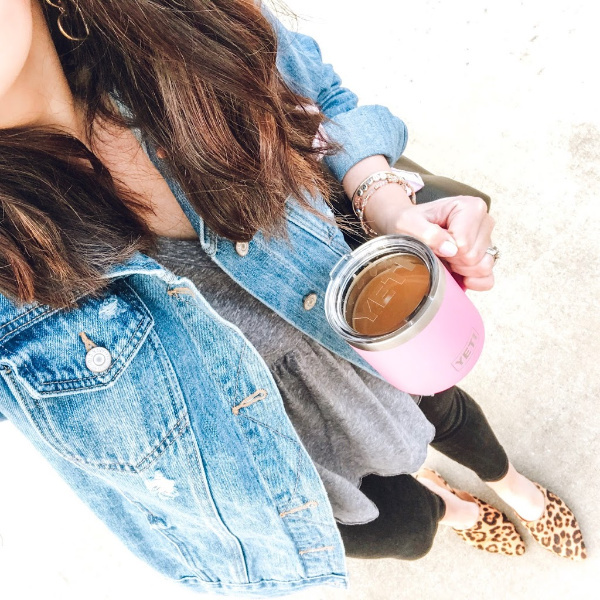 My favorite accessory is... coffee. Haha! It's a tired mom's best friend. Several people have asked me if these mugs actually keep your coffee warm and the answer is yes. Sometimes I even have to add a couple ice cubes because it's so hot! Love this mug! I picked up these items on my last shopping trip. I am really love the pink and coral combo! Also, how cute is this hair clip?! 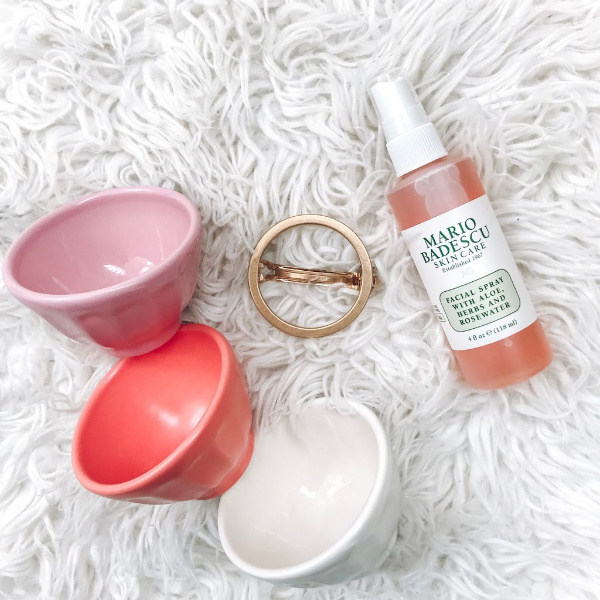 The facial spray is one of my fav beauty products! Last Saturday, I spent the day thrifting with my mom. I am always very selective about my purchases when I'm thrifting because it can be so tempting to overbuy. This adorable three dollar vintage vanity mirror was my only purchase and I absolutely love it! My all time favorite patterns to mix are definitely stripes and leopard. 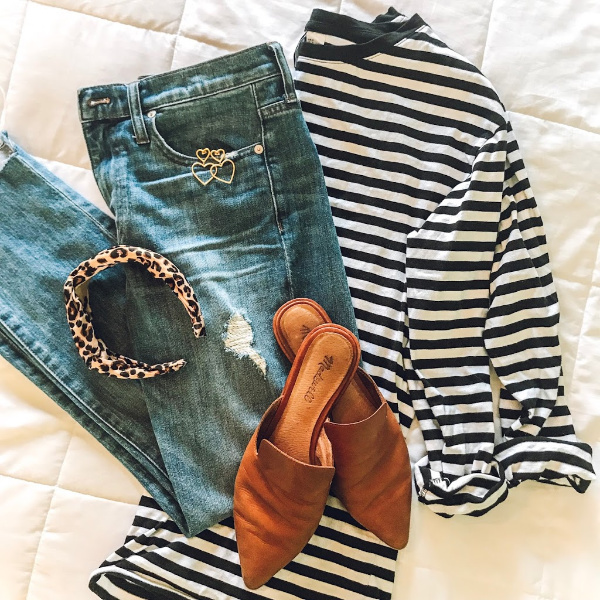 This striped top is one of my favorite recent purchases and it's also leggings friendly! 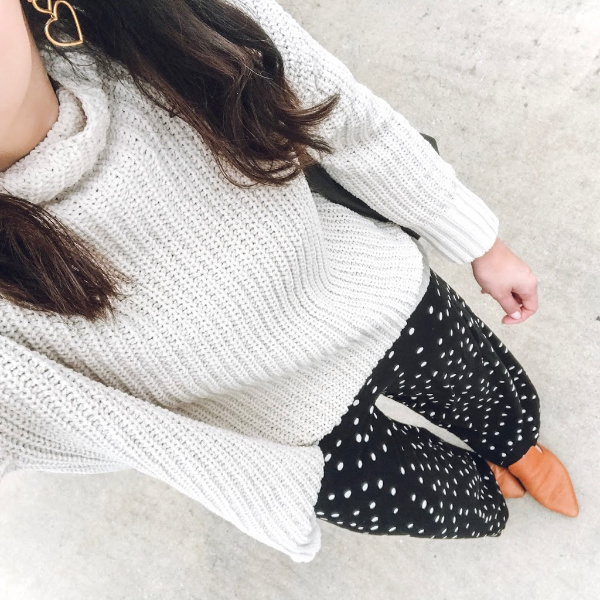 I'm so happy that polka dots are popping back up! I have always had a thing for dots. My husband even had a license plate made for me when we were dating that said polka dot princess, lol. 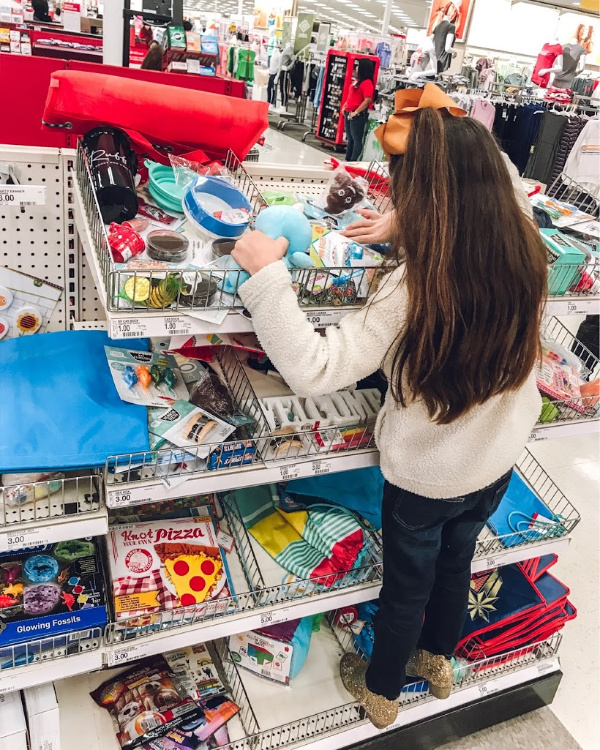 She's a serious shopper... just like her momma! 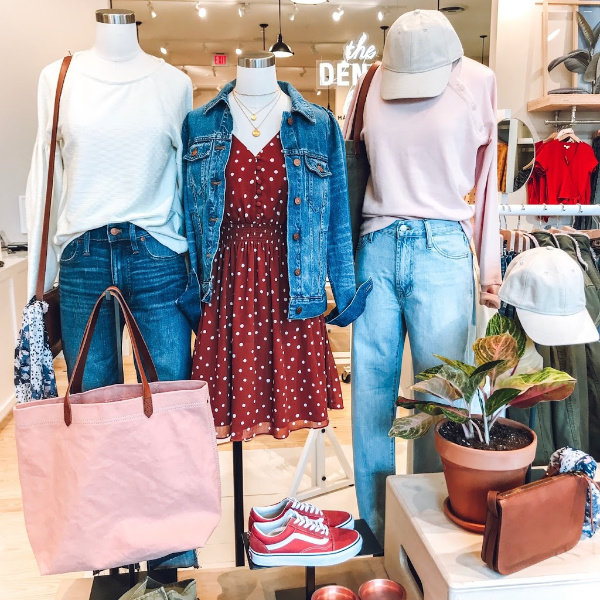 This display at Madewell is giving my spring fever! I love everything about it. Happy Friday! It's a Fri-YAY indeed... especially after my husband being out of town all week. Hashtag tired momma. But! We have a date planned for this evening, a thrifting trip with my mom on Saturday, and a birthday celebration for my dad on Sunday. It's going to be a great weekend filled with food, shopping, and quality time! 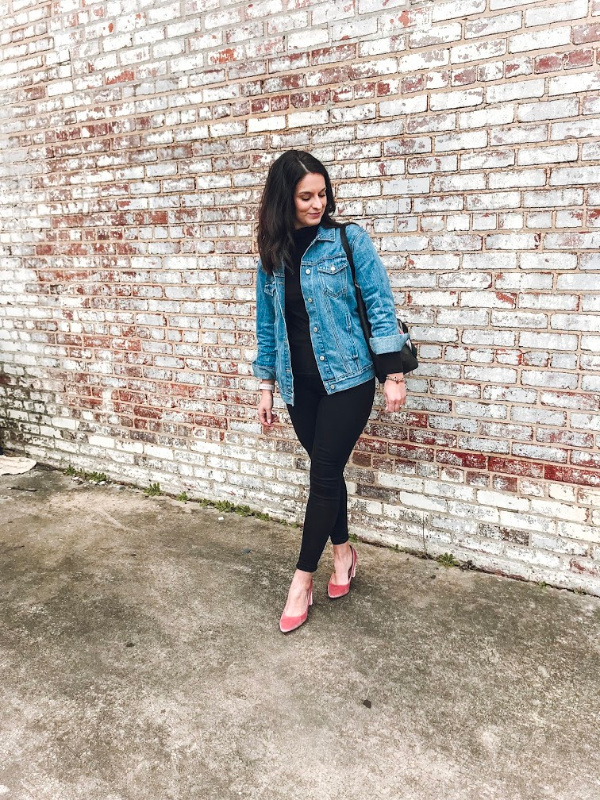 Today, I'm sharing my weekly roundup of what I'm currently loving and I clearly have spring fever. The weather has been all over the place here... rainy and thirty degrees one day and then sunny and seventy the next. What season is it anyway?! I am adding in more color (aka pink) to my winter wardrobe to make it to true springtime! 1. S T R I P E D P E P L U M | How darling is this top?! I love the feminine details, the pink, and of course, the stripes. Such a great piece! 2. 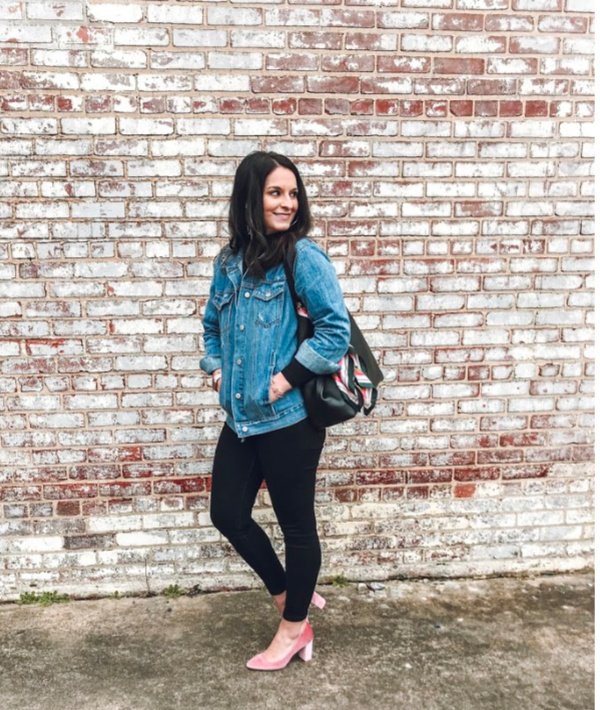 B A G | I love the vintage vibes of this bag! I have no idea what era this style would have been from but it totally gives me vintage vibes, lol. It's just too cute! 3. 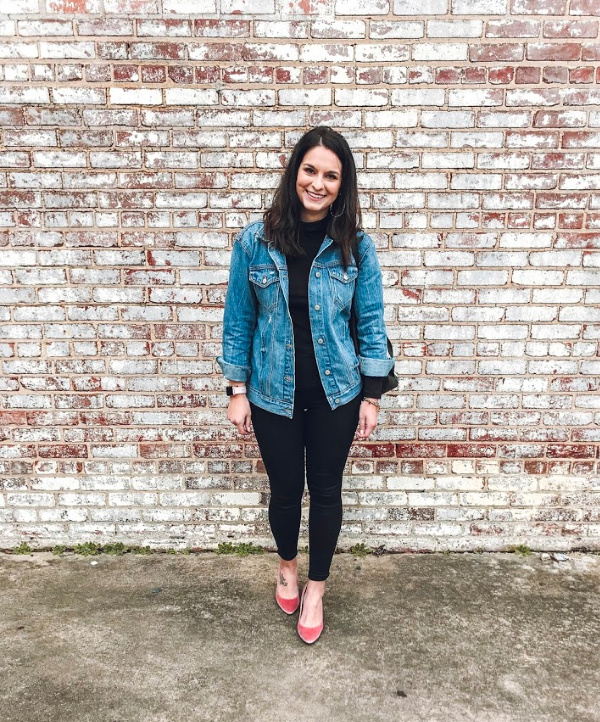 D E N I M | Everlane is my favorite denim brand of all time. 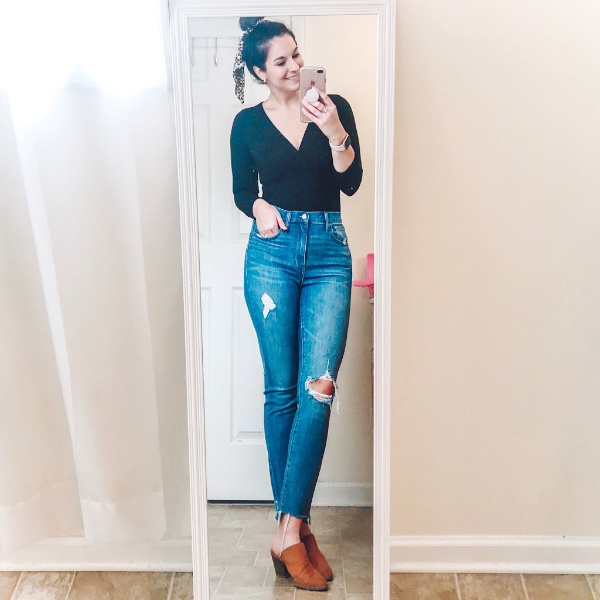 I love my Madewell jeans but the price and quality of Everlane just can't be beat. 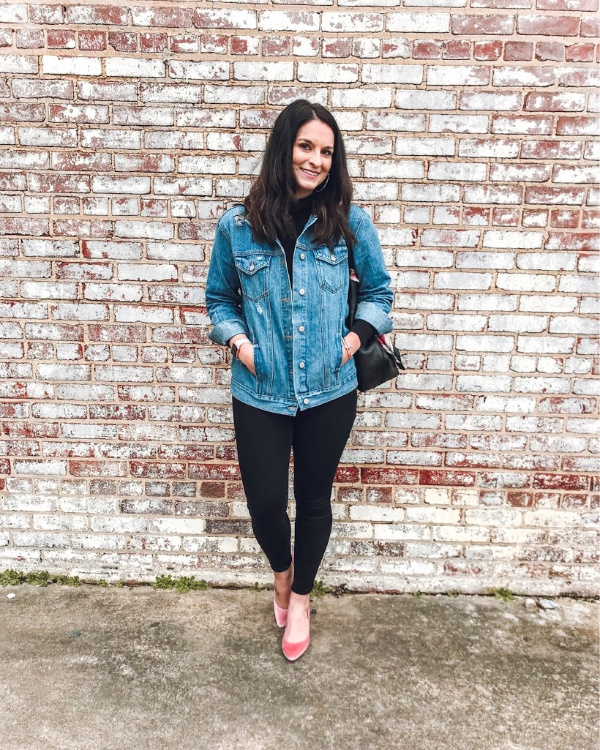 I own a dark denim and black denim pair that I literally wear almost every single day, especially to work. The high rise holds you in and they don't stretch out at all but are so comfortable. Yes, they are perfect! The fit is true to size. 4. M U L E S | I love my Madewell mules but I have been hunting for a pair that was more spring friendly and felt lighter, if that makes sense. I love the look of this pair and they have a really great price tag, too! So cute for spring! 5. S W E A T S H I R T | I was kind of feeling over sweatshirts until I saw this pretty one! I love the color (obviously) and the style. Adding to cart! 6. 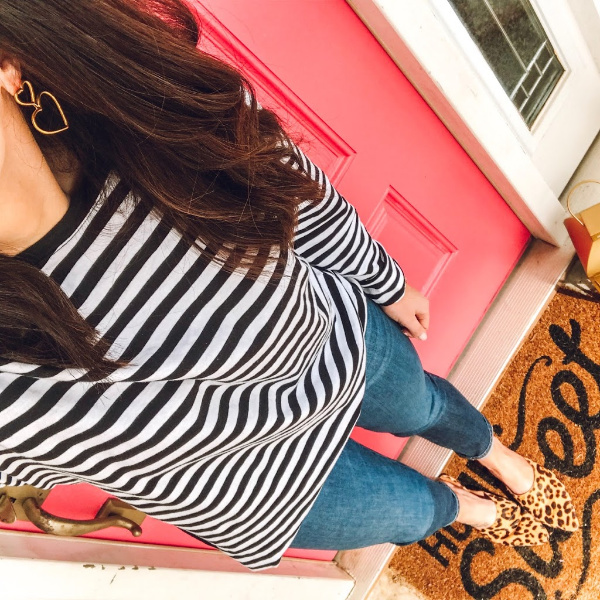 S T R I P E D T O P | I can't get enough stripes! I saw this top in the store last weekend and the quality is so good. I love the design and the cute tie detail! 7. T E E | I bought this tee last year and I still find myself grabbing it. It's a closet staple for me! I love layering it up with a cardigan or denim jacket. It runs a little big so stick with your regular size or size down one. I wear a small in this one. 8. H A I R C L I P | I bought this hair clip last weekend I love the circle design. It's so simple but makes such a pretty statement. 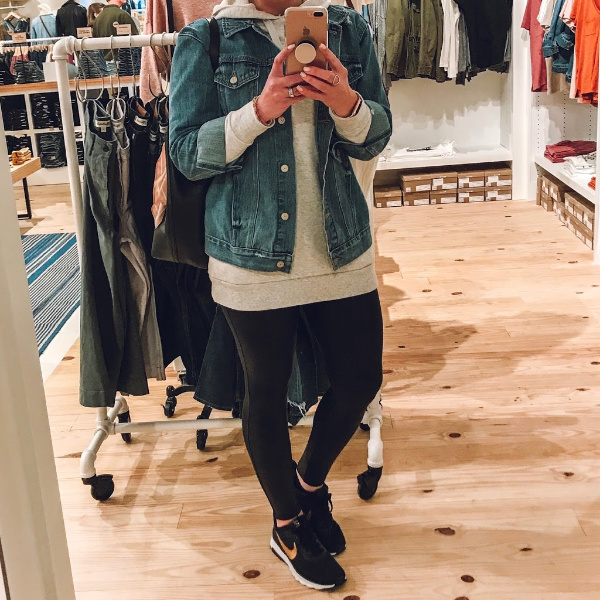 I have been on the hunt for an oversized, boyfriend fit denim jacket. It was something that I really felt like I was missing in my closet. Since I've been so much more selective on my purchases, I held off on buying one until I found one that I really loved for a price that I was willing to pay. 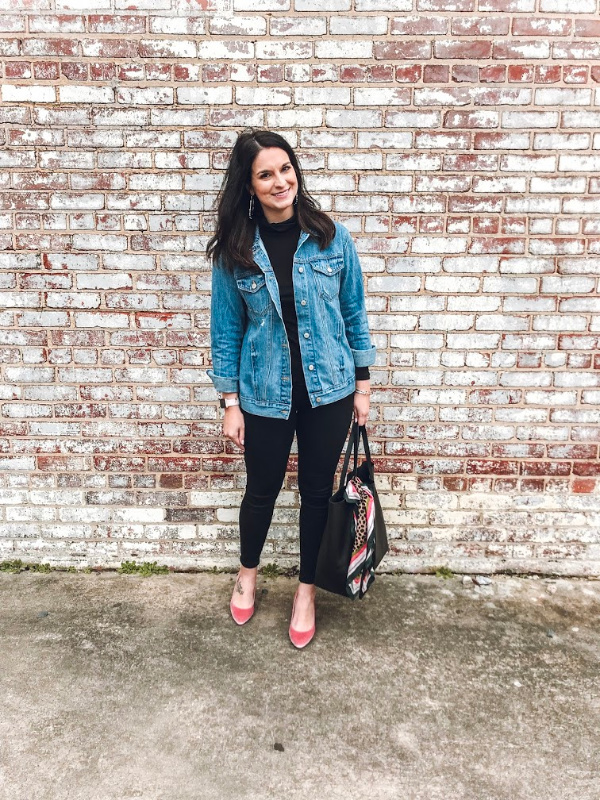 I've had such great luck with my other denim jackets from Old Navy so when I saw this one on their website, I knew I had to give it a try. I went to the store to try on the small and the medium plus I wanted to access the quality. 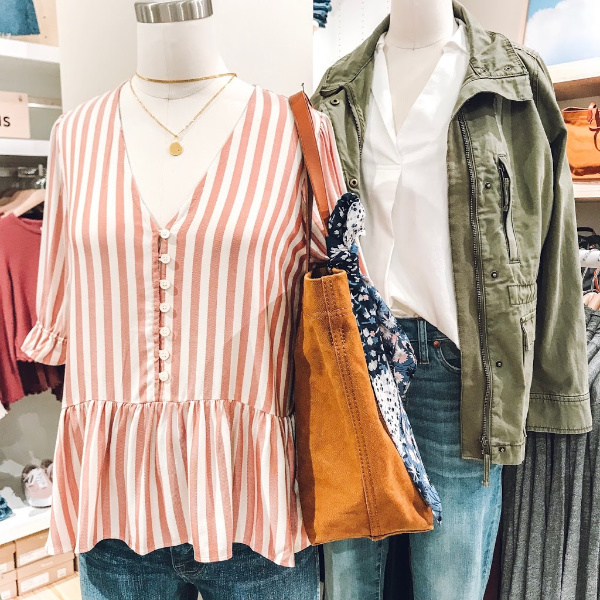 The fit is relaxed but I was looking for something a little more oversized so I found that sizing up one size gave me the fit that I was personally looking for. Next, the quality was really good. I was surprised how soft and well made the denim was. 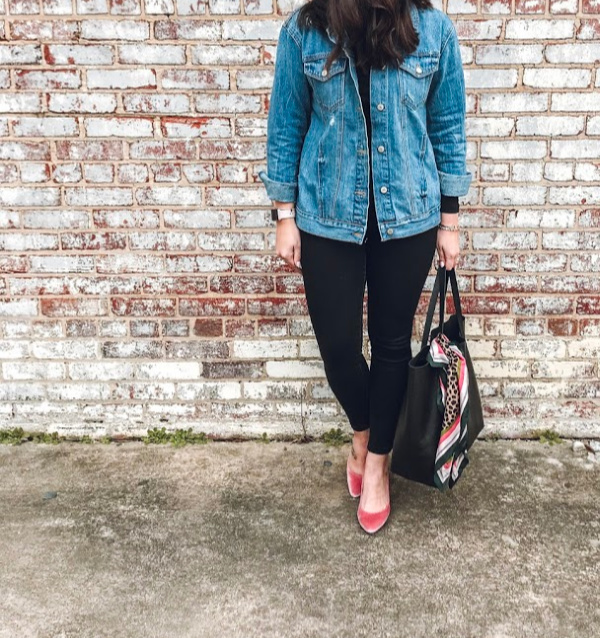 Actually, an associate at Madewell mistakenly thought that jacket was from there the day I wore it in the store! Nope. It's from Old Navy and a fraction of the price! 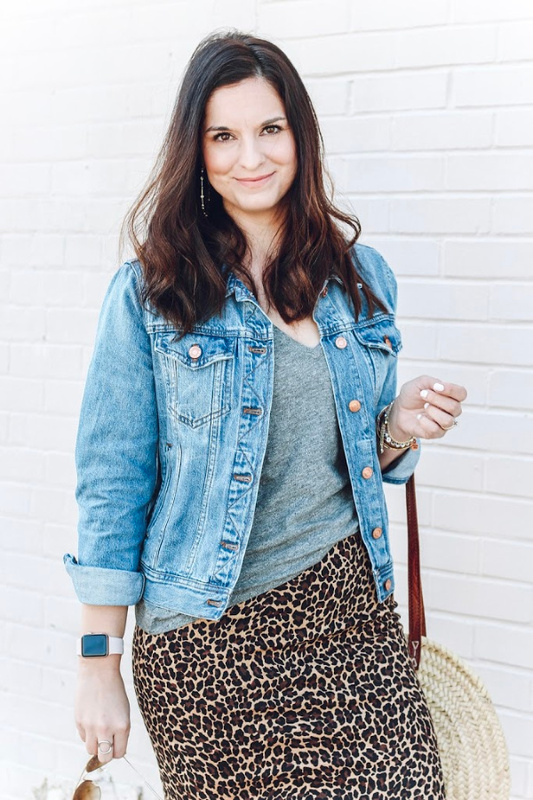 Yes to style on a budget! I've literally worn it just about every other day since I bought it because it's so comfortable and I just love the look. I paired it with an all black outfit and heels in the outfit featured today but I have also worn it with workout leggings and a tank. It's such a versatile piece! Happy Wednesday! I hope you are having a great week so far! 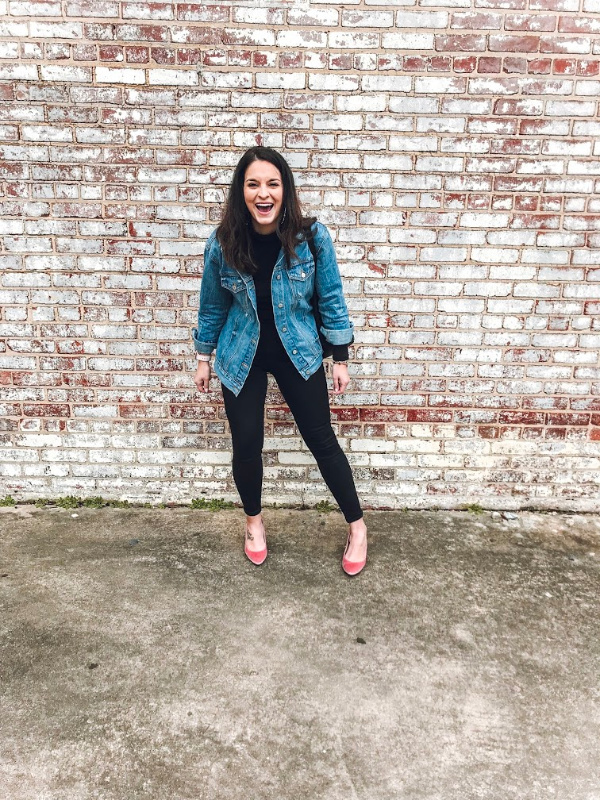 As I have been putting this blog post together, I have listening to my favorite podcast by Christy Nockels called The Glorious in the Mundane. I would highly recommend it to any woman! Every single episode has spoken to my heart. Well, today was no exception. I had missed the last episode of the season so I took the time while I was working at my favorite coffee shop this morning to put in my headphones and listen. In the busyness of the day to day, just stopping and soaking in good stuff (whether it be a conversation with a friend, a laugh with your kiddo, or a podcast) is just essential. To me, it's self-care. Something I have been wrestling with for awhile now is this blog and social media in general. I started all of this as a pregnancy diary, almost ten years ago. It's so hard to believe that it's been that long! In 2009, I had no idea I would still be coming back to this space, almost daily. It's changed and evolved over the years and I'm so thankful for every single person who takes the times to visit. This space has been exclusively for my family at the beginning, dedicated to thrifting at one point, sharing daily deals for awhile, collaborations with great businesses and boutiques, and so many outfit photos. Over the years, I have learned so much! But, also over the years, I have grown right along with the blog. For the past year, I have just been craving authenticity here and on social media. As much as I enjoyed my time almost always just sharing outfits that I put together as a collaboration, I realized that it wasn't really what I wanted for this space. I stopped pursuing those projects and decided to just share what I 100% genuinely love. This also meant pairing down my closet. Simplifying how I get dressed. Refocusing my budget on quality versus quantity. I just want y'all to know that this change has been so freeing to me. Maybe less people come by to visit my blog now but if you do, know that what you read and see is authentic. So, here's where today's podcast comes in. I have been struggling with my passion for style and pretty things. I honestly feel guilty sometimes when I spend time sharing material things. It seems so insignificant in the grand scheme of things. But, I have connected with so many people in ways I would have never had the chance to connect with them otherwise. Just know that my heart isn't in stuff. It's just a hobby but I am grateful for the way it has given me a platform and an audience. I hope that you leave my blog or one of my social media platforms feeling hope, some extra joy, or you just feel less alone. In order to do that, I'm working at balancing the pretty with the real (which is incredibly hard because I don't want to just be a highlight reel but I don't want to air all of my dirty laundry on the internet, either). But, I'm hoping that by sharing more authentic moments that it will help others feel less alone. Because you aren't alone! Let's capture, design, let's sing, let's draft and plan, sew and build, teach and lead, cook and comfort, carrying in our hearts a better home and a better garden, a better country, heaven meeting earth everywhere we go, the smile of God in your eyes, and on everything you touch. 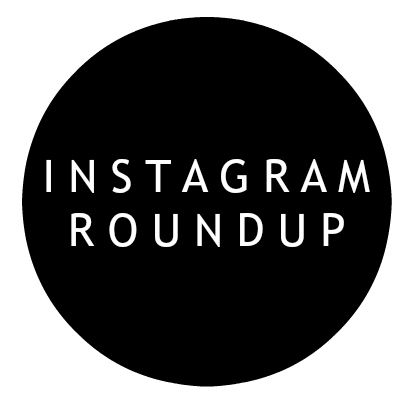 Today, I'm sharing my weekly Instagram Roundup. I greatly appreciate all of your love and support here on the blog, Instagram, and beyond. I'm grateful for you all! 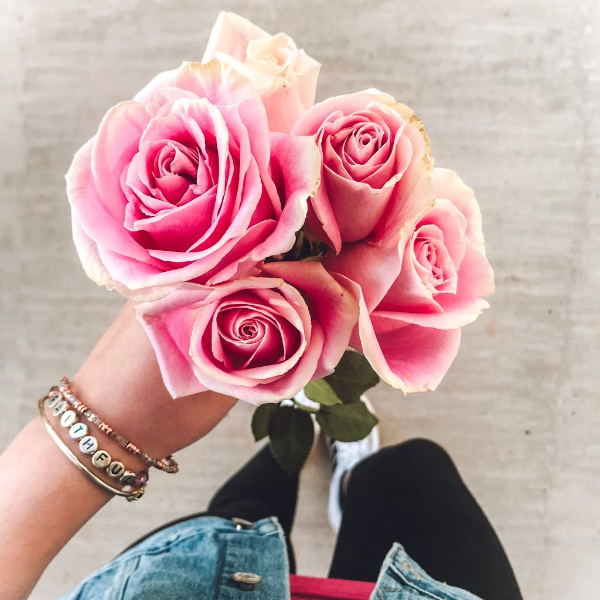 There's just nothing like fresh flowers. My husband gave the girls this little bouquet for Valentine's Day and I just absolutely loved them! 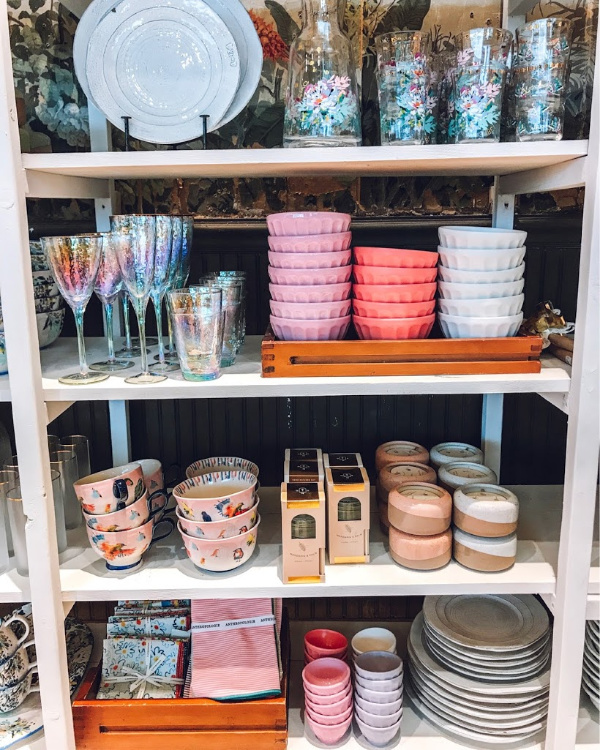 How pretty are these items at Anthropologie?! I am loving the cheerful colors, especially on this super dreary, rainy, cold day! Y'all... this body suit is $10 and makes you feel like at least $100! 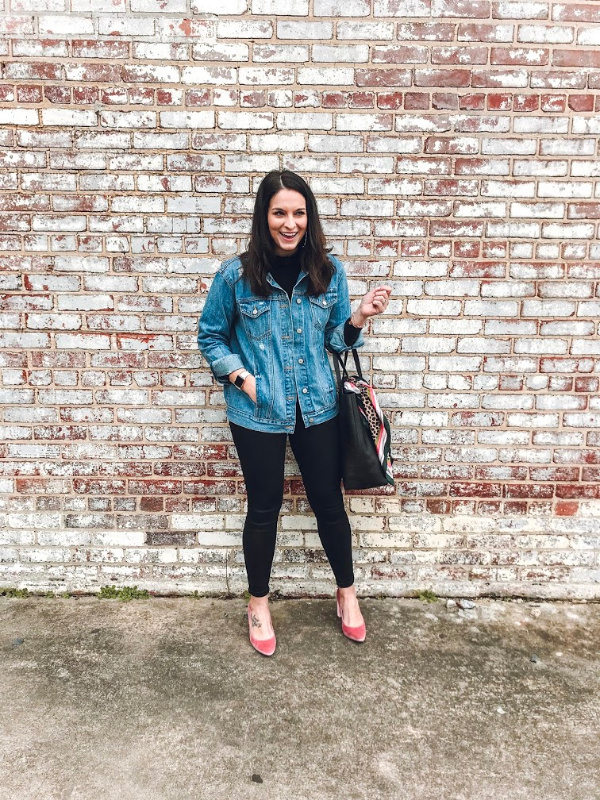 It's so flattering and great for layering while it's cold outside but it's also great on it's own with a pair of high rise denim. I'm wearing a size small and I found the fit to be true to size. We have a Madewell store less than 30 minutes away now and I've already been twice. I'm so excited to have my very favorite story close by! I don't pattern mix quite as much as I used to but stripes and leopard will forever be my favorite way to mix patterns. Also, this $15 is a must-have! Leggings friendly, too! 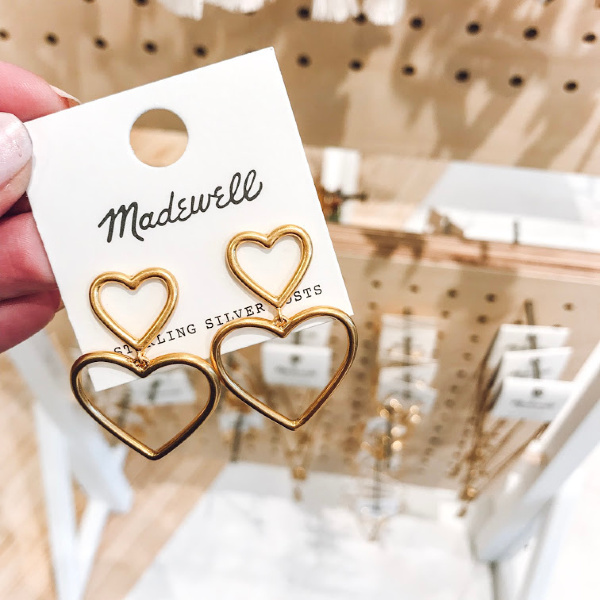 I wore these darling earrings every single day last week. And... I grabbed them to wear again yesterday. They are lightweight and so feminine! My girls had their dress rehearsal for competition dance this past Saturday. I spent two hours doing their hair and makeup so that's why my head is chopped off in this pic, lol. They totally had better hair and makeup than I did that day! I definitely underestimated how long it would take to get them stage ready. But, they had the best time and I'm excited for our first competition!